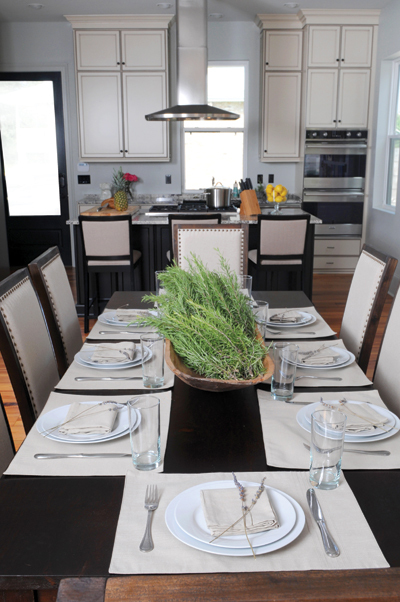 A wooden tray filled with fresh rosemary creates and interesting centerpiece on the dining room table. Kim and Jamie Monuz have a new house in Lakeview, just off Fleur de Lis Drive, that combines a traditional exterior with the best of an open floor plan. “We love the openness of the house,” says Jamie, the general manager of Dickie Brennan’s Bourbon House Restaurant in the French Quarter. “When we fold open the wall of windows in the great room, we step outside to an outdoor living area, swimming pool and even basketball and volleyball courts for Jordan and Maxwell “Max” – our twin 12-year-old sons.” The house works perfectly for their busy family that includes Tyler Burke, her 23-year-old son who lives with them, adds Kim, a registered nurse and owner of Nola Pilates and Xtend Barre. The couple called Gwen Loria, an architectural designer, to create the plan, with Paul, her husband, as the contractor. “We were familiar with the three homes in our area Gwen had designed and Paul had built, and we were impressed with her attention to detail and that each house has its own distinctive style,” Jamie says. There is nothing cookie cutter about the Munoz home. “There is a pleasant simplicity to the design,” Kim says. “Yet Gwen incorporated our every request.” On one side of the foyer, the space under the stairway is a unique “apartment” for Bogey and Sugah, their English bulldogs. “It is so much better than keeping them in crates,” she continues. “They love having plenty of room to be comfortable.” And Jamie’s dream, an interesting wine storage area, is nearby. “We have a great collection of wines and it’s all out in the open for easy selection,” he says. Designed by architectural designer Gwen Loria with her husband Paul as contractor, the new home in Lakeview combines a traditional exterior with the best of an open floor plan. Jamie and Kim Munoz with Jordan and Maxwell “Max,” sitting on the patio with Tyler behind them. On one side of the foyer, the space under the stairway is a unique “apartment” for Bogey and Sugah, the family’s English bulldogs; nearby floor-to-ceiling wine storage is a dramatic addition to the space. The couple especially likes the master bedroom-bathroom wing of the house, where the freestanding tub only uses a glass wall to divide it from the bedroom. “We also love that there’s a glass door from the bedroom to the outdoors so we can easily have a midnight swim if we wish,” Kim says. She also likes the way Gwen designed a wall of closets along the hallway that separates the master suite from the great room. A glass wall separates the tub from the bedroom in the master suite; the same reclaimed pine used for the floors throughout the downstairs was used for the wall that separates the tub from the large shower. A wall of closets lines the wall of the hallway that separates the great room from the master suite. Bogey and Sugah, the family’s English bulldogs, pose in the comfortable great room that includes a large sectional sofa. The outdoor living area that joins the open floor plan through a wall of windows that fold accordion-style to one side, features a fireplace and comfortable seating for easy entertaining. The large upstairs suite for Jordan and Max, the couple’s 12-year-old twins, features different sleeping areas on raised platforms, with a comfortable sofa at the core of the room.